In 10-inch skillet, cook beef over medium-high heat 5 to 7 minutes, stirring occasionally, until thoroughly cooked; drain. Stir in sloppy joe sauce. Reduce heat; simmer uncovered 5 minutes. If using classic crust: Heat oven to 425°F. Sprinkle cornmeal on 14-inch pizza stone. Unroll dough on pizza stone. Starting at center, press out dough with hands into 14-inch round, forming 1/2-inch rim. If using thin crust: Heat oven to 400°F. Spray or grease 15x10-inch or larger dark or nonstick cookie sheet. Sprinkle cornmeal on cookie sheet. Unroll dough on cookie sheet. Starting at center, press dough into 15x10-inch rectangle. 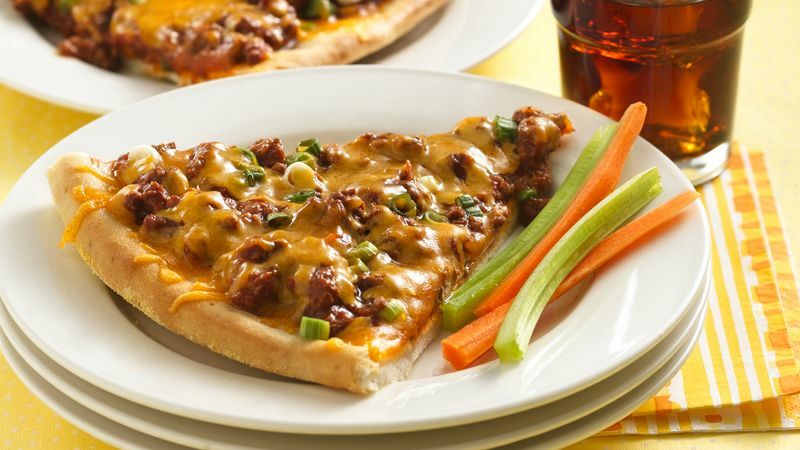 Spoon hot beef mixture over dough. Top with onions and cheese. Bake classic crust 18 to 23 minutes, bake thin crust 15 to 20 minutes, or until crust is golden brown. Cut into 8 servings. Turn up the heat when you add chopped green chiles with the green onion.